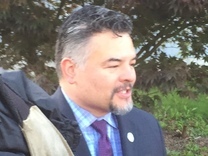 New Portland Public Schools Superintendent Guadalupe Guerrero celebrates International Walk + Roll to School Day with the Jason Lee K-8 School community, seen here with Capt. Mike Crebs of Portland Police, Terese Harris, a parent and staff member at Jason Lee, PBOT Assistant Director Chris Warner, PBOT Safety Program Manager Dana Dickman and Noel Mickelberry, Executive Director of Oregon Walks. Photo by Dylan Rivera, Portland Bureau of Transportation. (Oct. 4, 2017) New Portland Public Schools Superintendent Guadalupe Guerrero and PBOT Assistant Director Chris Warner today joined local leaders and advocates, as well as students and parents from Jason Lee K-8 School in NE Portland for a walk to school in celebration of International Walk + Roll to School Day. This annual event, celebrated by students around the globe, is an opportunity for families to see firsthand how fun, easy and safe walking, biking or rolling to school can be for students. Every weekday, close to 65,000 school kids traverse Portland’s streets to get to school. 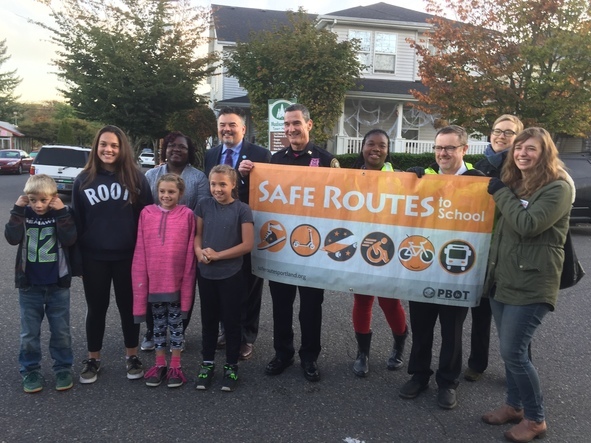 PBOT’s nationally recognized Safe Routes to School program helps to ensure that they arrive safely. A partnership between the City of Portland, schools, neighborhoods, community organizations and public agencies, Safe Routes to School serves more than 100 Portland schools in five school districts. The program combines educational outreach and targeted street and signal safety improvements along the routes Portland’s kids use to get to school. The goal is to encourage students and their families to get to school in ways that are active, reduce traffic, increase safety and contribute to a cleaner environment. Since 2006, the program has increased walking and biking to Portland schools by 35 percent. Fixing Our Streets, the locally funded street repair and traffic safety program approved by Portland voters in May 2016, will invest $8 million to make routes to Portland schools safer and more convenient for kids to walk and bike to school. Project installations on primary investment routes are expected to begin in the summer of 2018. In addition, the statewide Safe Routes to School Program will have $10 million a year, growing to $15 million a year in 2022 as a result of the new transportation package passed by the state legislature last session. Portland will be able to compete for grants to build sidewalks, crosswalks and bike lanes that make it safer for families to bike and walk to school. Portland Safe Routes to School works with communities within five school districts in the city: Portland Public, Parkrose, David Douglas, Centennial, and Reynolds. International Walk and Bike to School Day is a global event that involves communities from more than 40 countries walking and biking to school on the same day. It began in 1997 as a one-day event. The event has become part of a movement for year-round safe routes to school and a celebration each October. Today, thousands of schools across America – from all 50 states, the District of Columbia, and Puerto Rico – and around the world participate every October.